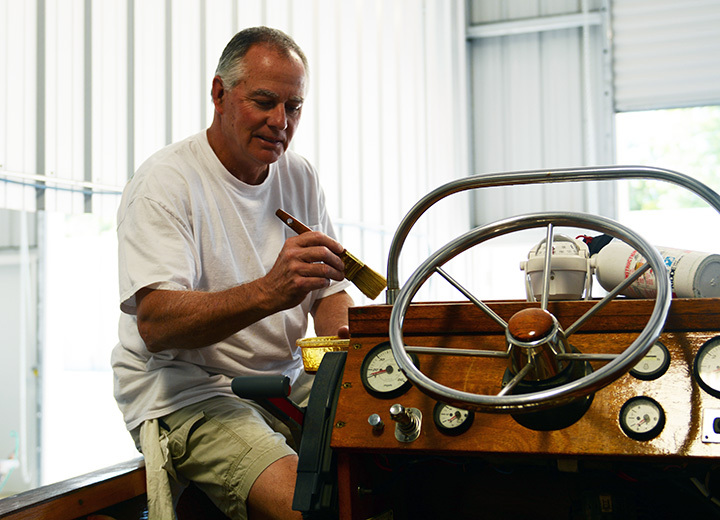 "My personal mission is to keep the Stauter-Built boat legend alive. 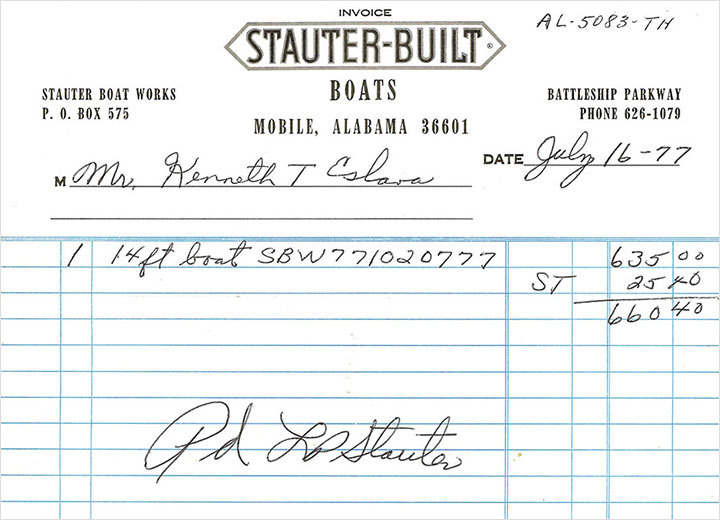 My father, brother and I all owned Stauter-Built boats throughout our lives here on Mobile Bay…..I expect one could say we were raised in them. If Dad didn’t want to use his Stauter on a given day, we would drive to Stauter Boat Works on the Mobile Bay Causeway, rent a Stauter for a couple of bucks…put our own outboard on it and away we would go to his favorite fishing spot. Dad was a City of Mobile Building Inspector, and a master wood worker. I spent many, many hours beside him as he built fine furniture and worked on his Stauters…..he was always customizing those boats to suit his specific fishing likes. Dad was a self taught, hands-on type of builder….similar to Lawrence Stauter, who to the best of my knowledge, never went to school to learn how to build wooden boats. At the end of the day, each and every Stauter are a one of a kind. Although they may appear similar from the outside, there were many options offered by Stauter Boat Works that make each one unique. Similarly, my father and Lawrence Stauters’ dedication to producing master grade products have shaped and marked my own approach to restoring and customizing wooden boats. The customizations that we do are all one of a kind…suited to each customers needs. One does not pick a customization design off of the shelf……I design and build each of them from scratch. After studying civil engineering and business in college, I spent 30 years in the pulp/paper & chemicals engineering business. The on to municipal government where I invested another 10 years in Public Works. I began the repair and restoration of Stauter-Built boats nearly 18 years ago on a part time basis, working nights and weekends to keep up with the growing demand for my services. In November of 2012, I retired from government and went into the wooden boat business full time. "My biggest satisfaction is Delivery Day, the customer’s satisfaction." “The Shock & Awe” or “Jaw Dropping” factor is what I specialize on, clients gets really awed and surprised when they see their restored boats! Even drawing a sketch clients can’t imagine, can’t perceive how beautiful it will be when it’s ready. When they see it the wow factor is always there, it’s real “shock & awe”. The fact that I can make a boat glow again is expected, the “shock & awe” factor unexpected. This is a fundamental component of our work because not everyone can do it. 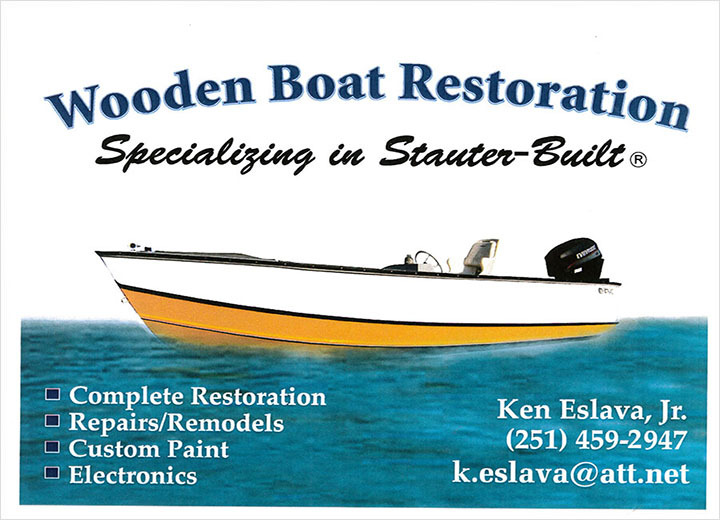 In 2012 I started working full time restoring Stauter boats, with complete dedication to "Wooden Boat Restoration, Specializing in Stauter-Built". This was a very important step in my life, aligning it with my life-time passion for wooden boats, fishing, and specially in the Stauter boats. I think that part-time I did about 250 boats, may be more. On a full-time basis I’ve already done about 50 boats. Working full-time I do much more detailed work and customization boat work. A major difference is that I take a lot of time to understand the client, for instance if he his a fisherman, what type of fishing he does, if he fishes sitting down or standing up. And this example is just the beginning, my approach starts with in-depth conversations with my clients until I fully understand the condition of his or her boat, his or her dreams and from there I advise them with ideas and options that they may have not thought and that would turn their boats into an ever better dream. My satisfaction is watching their faces and reactions when they finally see their boat, when they realize that their dream become a reality.